North Jakarta Water Resources Sub-dept. 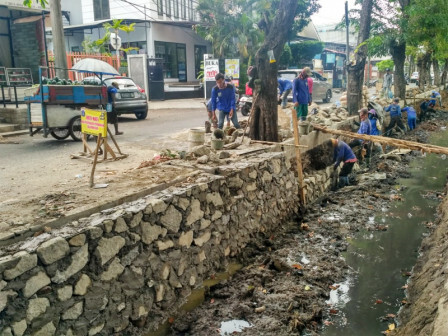 continues the micro and macro water channel's sheetpiles repair in six sub-districts, North Jakarta. Since January-November, it has been carried out up to 25 km length. "W e use river stone materials that are strengthened by concrete casting"
North Jakarta Water Resources Sub-dept. 's Maintenance Section Head, Abu Bakar disclosed that the damage of the sheetpile is varied, starting from collapse, cracking, etc. Apart from age, it is also triggered by the passing heavy vehicles. "W e use river stone materials that are strengthened by concrete casting," he expressed, Monday (11/5). The sheetpiles repaired is including the sheetpiles of river, connecting channel, and micro channel. The amount of damage in each sub-district is almost even. "Our officers are still doing sweeping. If the damage is found, we will repair it," he stated.